Gears of War™: The Board Game, designed by Corey Konieczka, is based on the wildly popular third-person shooter by Epic Games. One to four players take on the roles of COG soldiers cooperating to destroy the Locust horde, and must work together to complete missions against an ingeniously challenging and varied game system. 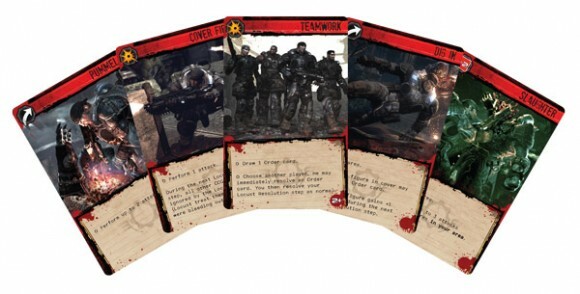 In Gears of War™: The Board Game, you’ll relive classic moments from Gears of War™ and Gears of War 2™. Roadie Run into cover, spray your enemy with blind fire, or rip him in half with your Lancer’s chainsaw! As a fully cooperative experience, Gears of War: The Board Game pits you and up to three friends against a deviously clever game system (you can even face the action alone with solo rules). Choose one of seven randomly constructed missions, and support your fellow COGs as your team engages an unflinching enemy in furious, white-knuckle firefights! As the Locust horde pours from its subterranean lair, you’ll quickly find yourself surrounded by hostile forces and cut off from your objective. Only through teamwork and communication will you gain a tactical advantage, completing your mission and striking a blow for humanity. Pros: Very like a first person shooter. Nice minis. Great solo play. Incredible artwork, gorgeous graphics. Smooth game play. Cons: It is out of print, so you’ll have to pay a lot for it. If you find it around $60.00 and you like this sort of games buy it; higher than that and you are not getting your money’s worth. Another minor con is that the COG figures are hard to tell apart from one another. If you have a background in Video gaming this is a good choice. I think the guys at Epic and Fantasy flight have done a good job on the production of this game. The designer Corey Konieczka of “Battle Star Galactica,” and “Eldritch Horror” fame does a great job with mechanics that are evocative of the theme and play very smoothly. I can’t complement the components enough. The cardboard is very thick and feels like it will last a long time. The components remind me of the ones in Level 7 Omega Protocol, albeit not as glossy. The minis are detailed and varied. It comes with dice and nice looking cards. The art on the cards is top quality even if it’s computer generated. This is a card driven game. You will use the cards to execute actions and they also represent your life points (I love this mechanic) Line of sight is not convoluted or too abstracted for it to distract you from the theme. The scenarios that come with the game are enough to keep you engage for a while. And the fact that regardless of the mission you can randomize the tiles, this gives the game extended re playability. If you play with only one of the characters it can become very, very difficult very fast. So, take on the roll of more than one and pray that the locust won’t get you. I play this game a lot by myself and I’ve always found it a nice transition from a first person shooting video game. 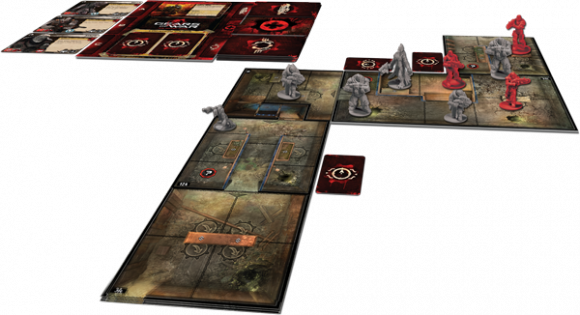 Gears of War: The Board Game, developed by Fantasy Flight Games (FFG), is a translation of the popular video game franchise to a board game that can play 1-4 players. It is a cooperative with varying scenarios, random map setup, and AI controlled enemies. Overall, the components for this game are well done. Since this is a FFG game, most people first notice that it is “component light” compared to most of their line, but what they provide works well. You get plenty of cards for various decks, plastic sculpted figures for both Locust enemies and to represent the players, cardboard tokens for enemy wounds and ammo/grenade the players have available, custom six-sided dice, and plenty of double sided cardboard map tiles. There are two things that I wish were different. First, I wish it came with more dice. But knowing FFG they will offer dice sets for sale online sometime in the future. Second, 3 of the 4 figures that represent the players are too similar. If you study the figures you can see minor differences, but trying to play quickly and with new players can lead to confusion; especially if the figures all stick together on the board. In fact, all four characters are holding the same weapon, and one of them doesn’t start with that weapon. Solo Play – This game scales up to 4 players, but also scales down to a single player. With the spawn changing based on the number of players, and the AI cards controlling the enemies, this works really well. A lot of games that claim to play single player tend to not interest me as a solo game, but this is a game I can see myself making an exception for. Cooperative Play – Up to 4 players work together as a unit trying to complete a scenario objective. The enemies are controlled by AI cards that control how they move and attack. Showing your card hand is not allowed, but table talk is strongly encouraged so that strategies are worked out, but the individual player is responsible for what card they play and how they use it. Hand Management – Hand management is crucial in Gears of War. That handful of cards you’re holding on to as the game starts? Yeah, those cards go quick. No big deal, right? Wrong, that handful of cards is also your current health and they will dwindle fast. You get to draw up to 2 cards at the start of your turn, without going over your max hand limit/health (which is six for most characters). Those cards (also known as Orders) also have multiple uses. Each one has text on it that you can resolve, a symbol towards the top that can be used instead (Follow, Guard, or Dodge), or you can discard it for a basic (move or attack) or special (revive a fallen player, pick up dropped weapons, or activate an area’s equipment icon) action. You also have to use at least one card each turn, but as the game progresses you’re looking at using 2-3 cards easily if you can spare them. But, when an enemy attacks and wounds you, you have to discard a card for each wound you take. If you can’t discard enough cards, you are considered bleeding out and can’t do much of anything until another player discards a card to revive you. As the game progresses it is not uncommon to be wondering if you should discard a card to dodge, or would you be better off taking the attack to see how many cards you lose that way. Dice Rolling – Yes, the random element of dice rolling is involved in this game. This is a mechanic that can be a killer for some people. I actually had a player walk away from a second play because of the dice element (the dice for attack weigh heavier than the defense dice). Everyone else hasn’t had too much of an issue with it and it adds to the tense feeling of how to best utilize your limited cards/health. Scenarios – The game comes with 7 scenarios. This sounds like a small number, but the modular setup of the board makes it slightly different each time you play. I can also see some ability to work on your own scenarios if you want. And finally, FFG has started doing a lot more Print on Demand expansions to their games, and scenarios for this game lend itself perfectly for that. Modular Board – As I stated in the Scenarios section above, each scenario has a set amount (and side) of tiles that will be used, but they are always set up randomly. So even replaying scenarios can feel like a slightly different experience. For example the Emergence scenario relies heavily on access to grenades. Only one of the map tiles offers a chance to get additional grenades. Having that tile in as the last tile placed, making it so there’s no need to run back to another tile, is vastly different than having it be the first tile placed; so that running out of grenades means running back to the tile you started on. No Player Elimination – I’ll admit it, I have screwed this part up several times. I’ve actually killed off players if they take too much damage. The reality though is they are simply bleeding out. Which makes what they can do very limited (they can only move one space) and they still make the Locusts move/attack via AI cards. But they are still in the game and it’s to the benefit of the players to have someone revive the player so their actions can have some purpose besides making the Locust attack the players. Scalability – I’ve stated this above, but the game scales well by adjusting what spawns at the start of the game by the number of players involved in the game. Also, the fact that the Locust AI only happens at the end of a players turn means the attacking and movement of the Locust will be slightly less as well. But having more players is nice for the simple fact that if the Locust have multiple targets they can engage, the players get to choose the actual target. That can make the difference between continuing on and bleeding out. Like many gamers I thought this game was vaporware. FFG announced it so long ago and then went completely silent on it that most gave up on it and then forgot about it. I’m happy to say that not only did the announcement of the games arrival shock everyone into remembering it, but the game turned out to be a solid game. It’s definitely a game that attempts to slap you in the face while you’re playing it. It can be hard and challenging, especially initially. I’ve seen frustration, but I’ve also seen players dig in their heels and demand it be setup again. To me, that’s a mark of a game that did something right. Will it appeal to everyone? No. The dice are heavily involved and attack dice are stronger than defense dice. This definitely is not a eurogame beyond it has some hand management decisions in it. But if you like the video game, you like light war games, or you like a good challenge; this game is a good edition. I’m also a fan of any game I can teach easily. Of course, teaching it usually means you’ll see the Emergence scenario more than you might like (as it’s the shortest scenario/map), but with different players and the map being randomly setup, you will still enjoy the experience. Gears of War is a cooperative game 1-4 players that takes 1-3 hours to play, depending on the scenario. The game comes with 7 scenarios, however with a variable map setup and random enemy AI, each scenario should be usable for several games rather than the 1 time of many similar scenario-based games. Each player takes the role of a COG soldier, and their goal may vary depending on the scenario. Each player has a hand of 6 order cards that represent various action they can perform, but also represents their health. This means that every time you take an action, you are exerting yourself closer to death, so every action has to be carefully weighed against your current health total. Amazing. That is the only word to describe this game. I have played it with 1, 2, and 4 players and the game feels identical at every scale. Not once have I felt that the game was functioning differently because of the player count. Every action choice is agonizing, as cards can be used for 3-4 different purposes, and every one spent brings you closer to bleeding out. Every action has you trying to decide if this is the right moment to play this card, or if you might need the card when the Locust enemies attack. This is definitely one of the best cooperative games on the market right now. The game is hard as nails to win as coop. It gets out of hand quickly with bad guys! Card system for movement/actions is pretty unique. Once you get the hang of the real coop nature, it’s a lot of fun despite it being pretty difficult. Scenario could change, even prompting new creatures. Slighted toward the villain. I don’t mind this, but some don’t like games where the baddies have an advantage. Can be cumbersome to setup with the tiles. Overall, a fun coop game. I preface this by saying I have only played this solo, and that maybe I am missing something in the game that way. Maybe I’m expecting too much, based on a board game of an awesome video game, but it doesn’t seem too exciting to me. I got it as a birthday present, and have played it twice now solo. The tiles and game pieces are cool, and I was really excited to play. Maybe I’ll be even more excited when I play with someone else, but being solo felt a bit too boring. I can’t even get into roleplaying by myself, so that could be part of it. Maybe I can play a game at Stategicon and my review will change. Sorry if this review is bad, it’s my first one. I’m not good at explaining a game, so I tried to explain my experience instead. I am not a fan of this type of game(“humans” killing all “aliens” games), but having said that I played it because I do enjoy other cooperative games like Shadows Over Camelot and Defenders of the Realm. There is only one primary goal of the game-to seal portals and only one way to do it-kill aliens. For me there was simply not enough choice and diversity in the game to make it challenging and to make it feel worth replaying. You are going to advance, hope you get a good weapon boost early and then shoot stuff until you or the aliens are dead. I have seen this in to many other games of the genre and just want more from a game. I have played this a few times but have not been inspired to rush out and buy it. It is based on the popular GoW series, however, for me there is nothing that feels “unique” enough to make me rush out and buy this over other games such as Claustrophobia or Earth Reborn, Space Hulk or even something like the old game Mutant Chronicles by Pressman. Each player takes the role of a special character with some particular ability and attempts to achieve the scenario goal. This format has been around quite awhile(Mutant Chronicles is from the 1990s) but has only recently been recognized as a distinct sub-genre(cooperative) thanks to Pandemic and Defenders of the Realm and others who opened it up from a sttrictly sci-fi future war theme. Again, sadly, nothing made this game stand out for me from it’s predecessors. 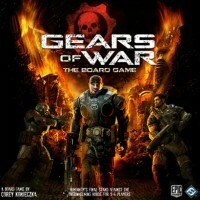 Add a Review for "Gears of War: The Board Game"